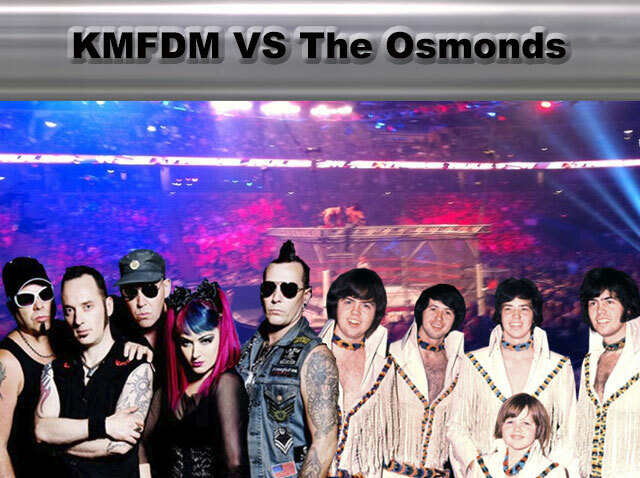 Steel Cage Match: KMFDM vs …The Osmonds? Until the mid 90s, I had a penchant for, shall we say, industrial rock sounds. I was such a fan of Cabaret Voltaire, who were the reason I put up with so many also ran bands. No other acts gave me what I got from them; intelligence, subversion, and aggression, wrapped up in a machine funk package. By the mid 90s, mostly thanks to Al Jourgenson’s proclivities, industrial rock was moving in what I perceived to be a regressive metal direction, and I drew a line in the sand and divested myself of lots of “industrial” releases that I now saw as culturally tainted. Particularly Nine Inch Nails [I only ever owned singles of theirs] and KMFDM, but not this one. “Godlike” was the A-side, but why I kept this release was for one of the B-sides: a cover of The Osmonds [!] atypical 1972 hit “Crazy Horses.” There was a period in the late 90s, when I had the itch bad to hear the original Osmonds tune. I went to Rock + Roll Heaven and thought it would be easy to pick up an original 7″ but I was wrong. For years later, I had only the KMFDM version of sate my “Crazy Horses” jones. Vocalist Sascha Konietzko had a delivery that was typically deep and guttural on this cover, but that’s fine. He’s German for crying out loud, so he comes by his guttural tendencies honestly! The loud stomping beat was pretty typical of the KMFDM gameplan. I once saw them on the “Money” tour, and by that time I was treated to almost a metal act. Riff metal with a big, stupid glam beat. The song’s, uh…distinctive hook was rendered here on synths, and the middle eight featured almost a parody of metal shredding juxtaposed against an almost humorous cheesy organ solo. Ultimately, the cover arrangement was close enough to the original to satisfy while having a foot standing in more typical KMFDM territory. 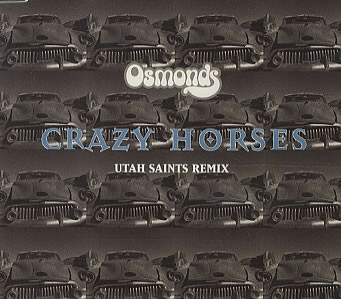 My ability to hear the original Osmonds version took a back seat to my fervent desire to never own anything of theirs more that the song “Crazy Horses.” It goes back to my childhood. During the bubblegum rock era, there were social breakdowns just like earlier int he 60s, when the question was “Beatles or Stones?” By 1970, the pre-pubescent set had their own litmus test to respond to. “Jackson Five or Osmonds?” I was down with the Jackson Five. The Osmonds had almost zero cool… with one big exception. “Crazy Horses!” The insane heavy eco-rocker that stood as proof of the day The Osmonds woke up and thought “let’s get a piece of Deep Purple’s pie!” That alone made it highly memorable, but it was ultimately the song’s utterly tasteless organ hook that once heard, was never forgotten. It was a sound so naked and raw in its grotesque audacity, that it somehow became a thing of awe. The tune began with several passes of the hook over “apache” beats replete with fills that kept it from attaining motorik status. Jay Osnond took the lead vocals here with his vocals a million miles away from the typical Donny Osmond pop most associated with this band. His initial delivery is not a million miles away from what Konietzko brought to the table nearly 30 years later. His ascending vocal delivery on the second and third verses prefigures the sort of screeching leads that Iron Maiden’s Bruce Dickinson brought to the genre during the NWOBHM. Only the Vegas horns punctuating the track remained as a concession to the typical Osmonds showbiz sound, but that, beyond kitsch wailing organ hook obliterated any conventionality that this track offered. I found a holy grail of sorts when investigating the now-defunct “Whizz Records” in the naughties when I saw the miraculous CD5 pictured above; a 1995 remix single of “Crazy Horses” with multi-referential remixing by the masters of stadium rave, Utah Saints. The disc had four post-modern remixes of “Crazy Horses.” They’re sort of fun, if horribly dated, but I bought it ultimately, for the 2:30 original mix added to hook me like an expert angler. After 46 years, I still have not heard anything to compete with its unbridled audacity/lunacy. 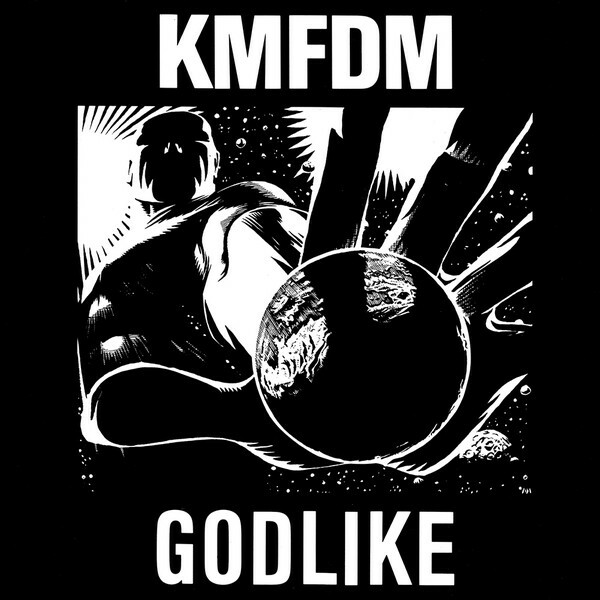 This entry was posted in Steel Cage Match and tagged 1972, 1990, cover version, industrial, KMFDM. Bookmark the permalink. 11 Responses to Steel Cage Match: KMFDM vs …The Osmonds? There are videos of this on youtube…..
Tim – I don’t think actually seeing the Osmonds perform this is recommended. This may be the most hilarious post in the history of your blog, Monk. I’ve never heard the KMFDM cover, but I am familiar with the Osmond original. What a head-scratchingly bizarre wig-out for a squeaky-clean boyband! HEY leave the KING outta this….. When he was good, damn he was good I ignore the rest. Sometimes. But I really love that “Almost Blue” album that he did, Imperial Bedroom and King of America are really good, too. Yup, people ask me if I like Elvis or the Beatles and I always answer that Costello guy has written some right good tunes. In all seriousness, though, my late brother and I were Elvis fans, we traded records of his like other kids would trade football cards. It was one of the few ways our otherwise quite divergent lives intersected. I sincerely like Elvis (both of them) and am sincerely picky about what I listen to (both of them). I second Tim on Painted From Memory being a great EC album. For me, Elvis the recording artist is all but dead*, but Elvis the live act continues to be an amazing performer that is a sheer joy to see. *I do still enjoy selected singles from EC. Imperial Bedroom just gets better as the years go by, however I would put in a vote for Blood and Chocolate and Painted from Memory, there’s also plenty of good stuff scattered across most of the other later period albums. I would agree though that Elvis now is a fantastically enjoyable live act, but albums seem much less of a priority for him, I guess he’s probably given us enough!